The Sanskrit word ‘yatra’ means ‘journey’, ‘path of life’ or ‘pilgrimage’. A yatra is a largely silent walk which offers an opportunity to explore and experience a variety of teachings for personal development in the company of like-minded people while travelling together through the outer as well as inner landscapes of our natural world. On a yatra, we are encouraged to follow certain principles to create a safe, caring and conscious environment. 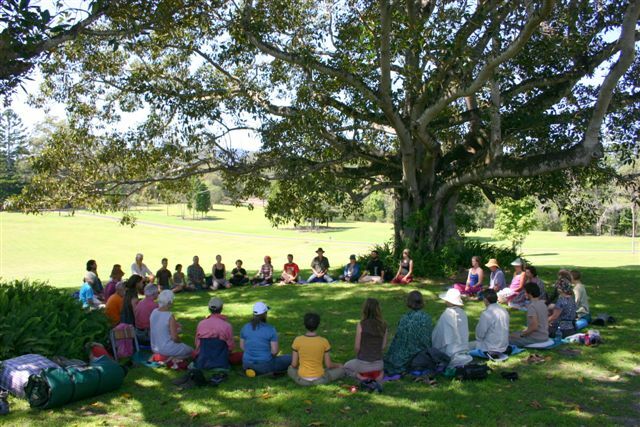 Yatras are run with the intention of creating a supportive community which facilitates quiet reflection. We walk and camp in a way which has a very low impact on the environment. There are silent periods on yatras. Generally, silence is honoured whilst walking during the day, and there is a period of silence between the end of the evening program and breakfast. In some circumstances, communication during a silent period may be necessary, which is acceptable. Silence offers a temporary space away from chatting and usually helps people to settle and to become more aware of their inner world. Our vision is to help people step outside their normal habits and get a fresh perspective on ordinary life. 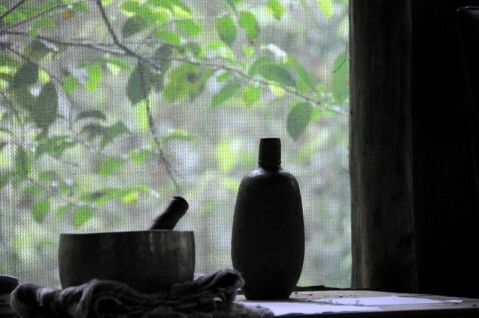 Yatras can assist people to see and experience that simple living can be satisfying and joyful. We encourage participants to let go of the usual luxuries of life and connect with the earth and simply walk in silence without a destination in mind. A Yatra provides experiences which offer physical, social, emotional and intellectual explorations in a non religious environment. We respect and draw from the wealth of knowledge and wisdom of our spiritual traditions and science as well as the elders and wisdom of the community. We endeavour to help people experience the richness of being part of a community. We form a temporary community where all participants are valued contributing members. A yatra is based on active participation. The support team needs help with tasks such as food preparation, washing up, moving luggage from one camp site to the next and packing up then setting up equipment at the camp sites. Active support on the yatra makes it possible to keep costs low and lifts the spirit of the group as we come together in a functional team. We ask participants to take personal responsibility for their own health, safety and well-being. We also ask people to take responsibility for equipment, for each other and for the environment. We believe that each individual has a stewardship role in caring for the earth’s human and natural resources, and we encourage a sustainable lifestyle. Our intention is to help people understand, appreciate, value, respect and preserve our natural world. We do this by providing opportunities for participants to live outdoors with time for observation, as well as interpreting the environments we move through. On occasion local background information is provided to demonstrate what instigated the protection of certain areas we walk through. We have developed different types of yatras, which are continuously evolving to meet the needs of a variety of groups. The Dharma Yatra and the Walking Man Yatra are part of a regular program. ‘Dharma’ is ‘the nature of things’ or ‘the natural law’ but also refers to teachings which lead to a deeper understanding of who, how and what we are. Dharma Yatras are journeys which offer opportunities to learn and practice meditation in a secular environment. The Dharma teachings introduce participants into the Buddhist way of looking at things and encourage investigation of our own experience and how we live. A Walking Man Yatra offers an opportunity for men to collectively investigate and enquire into the values and attitudes that have relevance for our journeys as men through life. The Deep Ecology Yatra helps with an understanding of how we view nature and how we see ourselves as part of nature. A long low cloud hangs over the hills. Its resemblance to a nightcap gives the surrounding national park its name. 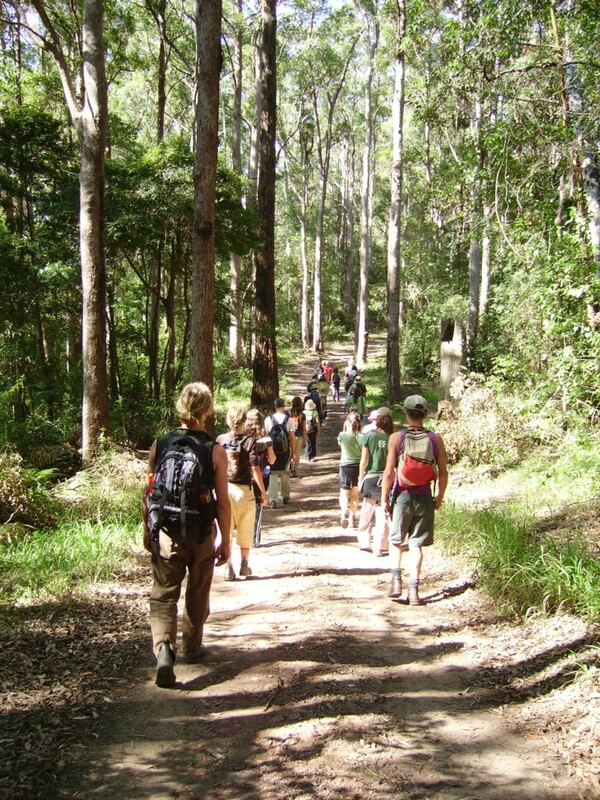 In early October a group of 28 people tread the soft moist earth of the subtropical rainforest. Many of them are newcomers to the dharma and many are long-term practitioners. All love the mix of dharma, sangha and walking meditation in a wild and natural environment. All find that placing one foot after the other day after day for seven days opens the heart and opens the mind. A day of silence midway through the walk, at the Forest Meditation Centre at “Dharmananda” community; a basic hall, kitchen and kuti or tent accommodation in the simple tradition of the forest monks of Thailand; offers the joy of the only hot shower in days, and a deepening of the silence reaped over the days of just walking. It is a sense of community that touches people as for one week we are a small tribal sangha exploring the landscape of the forest and our minds. The ancient rainforest trees with buttress roots like elegant skirts are similar to the trees that the Buddha sat under in the forests of northern India. We swim at a waterfall; someone lays spread across the rocks under the falling water. It is hard to see where the body and the rocks begin and end. Out in the elements with the frogs, lizards, birds, vines, mosses, escarpments, gullies and ponds as well as the ticks and leeches, no one complains. It seems like an epic journey of Tolkien proportions in distance, challenge and taking our greed, hatred and delusion into the fire of awareness. The days are in silence except for meal times. Each morning we do yoga and sit before breakfast, then we pack our lunches, de-camp and set off with a leader who knows the way in the forest. The tracks have been well researched by Ronny Hickel, instigator of the first Australian yatra (along with his partner Emma), yatra manager, yoga teacher and owner of “Cloud Mountain Homeland” where the walk begins. There are two cooks and three crew who pack the bags and tents into the truck and take it around to the next camp site where they erect the kitchen tent. Hot chai always awaits the tired and exhilarated walkers. After dinner there is a dharma talk or dharma activity led on alternate nights by Carol Perry and Victor von der Hyde. On days when the distance is not so great and we have more time, we have small group meetings for practice questions or dharma enquiry. 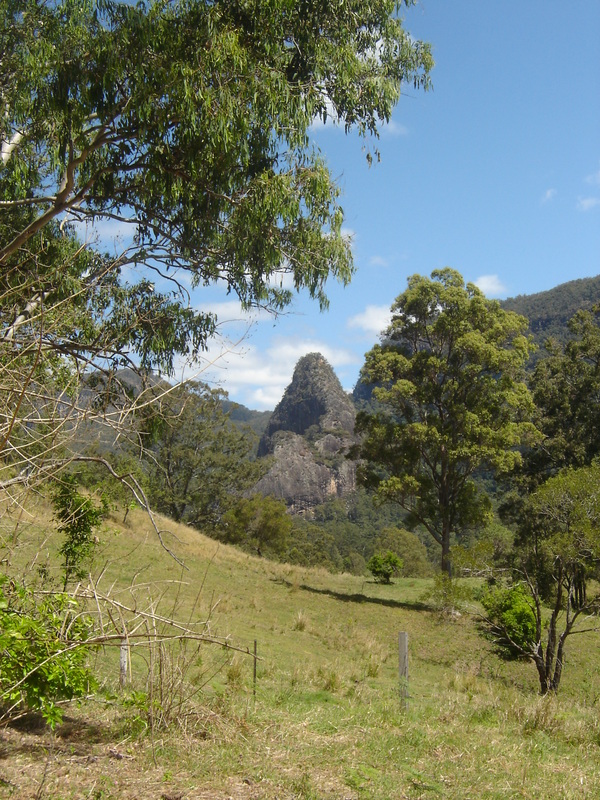 On the final night we celebrate at the Doon Doon saddle flanked by the towering escarpment of the Jerusalem rocks and overlooking Mount Warning; clouds sit low in the valley forming a white lake below pierced by the volcanic core of Mt Doughboy. The next morning we walk down to where we started at “Cloud Mountain Homeland”.